As previously mentioned I’m regaining an interest in CAD. A friend has asked me to fabricate some frames for his shed windows and that seemed and excellent opportunity to practice my welding and also some drawing (with welding symbols). Following Paul Tracey’s advice I selected my CAD system, in my case the key features were, export/save as DXF and image (so I can share drawings with others), low price, runs on Windows and I can work out how to use it. I looked at a few options and Draftsight was free and seemed as good as any so I installed that on my machine. I did complete a 2 week course in drafting at Dowty and then we had a day or so using AutoCAD, however that was 20 years or so ago and I don’t remember too much. I have dabbled with Turbocad a few years back but nothing serious. So it’s taken me rather a long time to produce one drawing but here’s my first results. One tip I’ve worked out, to handle the inside dimensions. Simply add a construction line (just a line that will be deleted) between the points to measure, then use the smart dimension tool to add the dimension to that entity. Finally delete the construction line and you get the desired result. Obviously as soon as I printed it out, I spotted some issues. The projection lines need trimming back as they join with the frame and tollerances need to be added. One that’s not so obvious from the pic is the border does not line up with A4 paper so that also needs tweeking. If there is anything else wrong, please let me know. 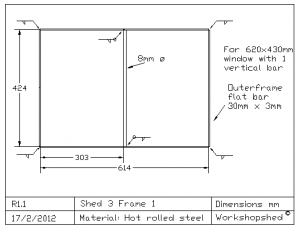 You can also create and design your very own sheds through your knowledge in CAD.